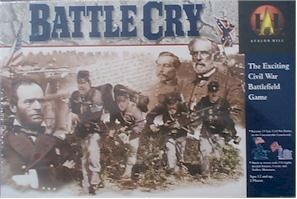 Battle Cry - 15 Epic battles - and you are in command! Step back in time and lead your armies to victory in 15 classic Civil War battles. Fascinating historic scenarios and maps are provided for each battle. Infantry, cavalry and artillery units match those that participated. Even the customizable gameboard reflects terrain and features from each battlefield. But, there is one difference: You are there! Can you change the course of history? Will the Union be preserved? Or will the South prevail? Use your military talents to decide the future of America. March to victory with 116 historically accurate, highly detailed infantry, cavalry and artillery miniatures.